Before the advent of digital photo books, there were scrapbooks — and scrapbooking continues to be an ultra personal way to artistically capture your favorite memories. And even though scrapbooking has been around for ages, your kids might have a renewed interest in it these days — I mean, if Poppy from Trolls makes scrapbooks, why can’t they? Whether you put together an annual album or create single subject scrapbooks in honor of special events, building a beautiful scrapbook is easiest if you start with the right tools and materials. Choosing the right tools often means looking for items labeled archival quality and acid free, meaning they won’t fade or corrupt your photos over time. While some scrapbookers like to work from templates or theme specific kits (and you can certainly find loads of stickers and embellishments if you wander through your favorite craft store! ), this shopping guide is meant to bring you the fundamental items any scrapbooker should have stocked in her craft closet. Scrapbook albums come in a variety of sizes, but the standard working size for beginners is 12” x 12”. Available in nine solid colors, including neutrals, pastels and bright options, this fabric-covered album is 12.5" x 13.5" overall and fits 12” x 12” pages. The package includes 12 top-loading vinyl page protectors with white, acid-free inserts. The album is a post-bound album, meaning you screw the pages in instead of clipping them, as you would with a D-ring album. Reviewers like the color options and consider this album “sturdy” and easy to add pages to. Once you’ve created your scrapbook pages, plastic page protectors will keep the layouts fresh as you load them into your album. These top-loading 12” x 12” page protectors are acid-free and archival quality and fit both D-ring and post-bound albums. The two-pack comes with 20 total high-clarity page protector sheets. Reviewers call them “the best page protectors” they’ve found and like the price too. Every beginning scrapbooker should have a large and small straight edge pair of scissors. While you probably already have a large pair of scissors in your home, a pair of small straight edge scissors is necessary for scrapbooking projects (and if you really get into it, you can add decorative-edge scissors to your collection as well). These five-inch scissors have a small tip for cutting out details on paper, vellum and photos, with a non-stick surface for cutting through tape or other sticky materials. They work for right- or left-handed people. Reviewers say they’re “extremely sharp” and good for “fussy cutting” projects. 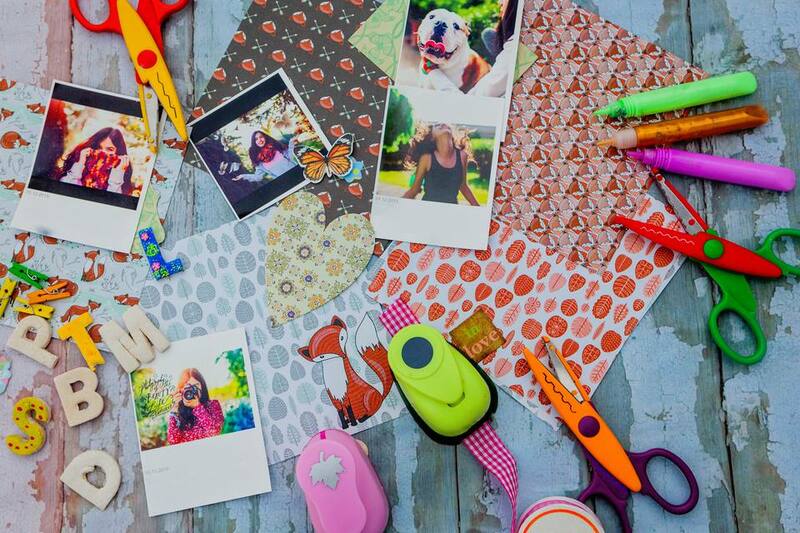 Journaling — as in, writing notes or small stories about the photos you’re presenting — is as much a part of the scrapbooking processing as is choosing the photos and assembling your layout. It’s important to use fade resistant, colorfast and waterproof inks that are also acid-free and archival quality. A set of dual-tip markers will give you the most color and writing options as a beginner. This set of smudge-free markers boasts fast-drying, permanent ink and a range of subtle colors. Reviewers find them great quality for the price with “vibrant” colors.